From the Middle Ages to the close of the 17th century, alchemy was fundamental to Western culture, as scores of experimenters sought to change lead into gold. Though its significance declined with the rise of chemistry, alchemy continued to captivate the imagination of writers and its images still appear in modern creative works. 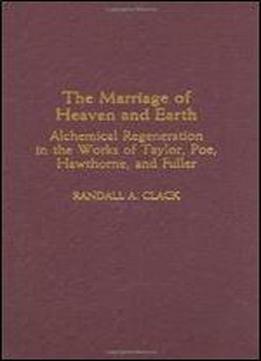 This book examines the literary representation of alchemical theory and the metaphor of alchemical regeneration in the works of Edward Taylor, Edgar Allan Poe, Nathaniel Hawthorne, and Margaret Fuller.While Taylor used alchemical metaphors to illustrate the redeeming grace of God upon the soul, these same metaphors were used by Poe, Hawthorne, and Fuller to depict a broader concept of redemption. These later writers used alchemical imagery to describe both the regeneration of the individual and the possible transformation of society. For Poe, alchemy became a metaphor for the transforming power of imagination for Hawthorne, it became a means of representing the redeeming power of love for Fuller, it figured the reconciliation of gender opposites. Thus these four American writers incorporated the idea of regeneration in their works, and the tropes and metaphors of the medieval alchemists provided a fascinating way of imagining the transformative process.